I'm hiding out from bedtime duties as I type this, so instead of some kind of introduction, let's just get right to it! Plus, we all know how awkward and tough writing a post introduction can be, right? Why is that?? I always feel like mine sound so cheesy and cliche...like "Hey February! Thanks for all the nice weather lately!". Thinking about: Sully's birthday coming up and how it is possible that I'll have a two year old?? It's so crazy how fast it all happens. It doesn't feel very long ago that I was pregnant and getting ready for his arrival. And then, I always thought we'd have our next baby around the time he turned two, because that seemed like "the perfect" age gap, but now I'm like, my goodness, I don't know that I would have wanted to be pregnant some time shortly after his first birthday. Before having a kid, two years seemed like it was such a long period of time, and plenty of time to get pregnant in. But that's not the case at all. It flies by, and with each passing month, my son is getting older and I can see how easy it would be to put off having a second baby for another two years. Or not have another child at all. Except, I do want a sibling for Sully, if it's in the cards for us. We shall see...(this topic really deserves it's own post so I'll leave it at this for now). Reading: I just started reading The Choice by Nicolas Sparks. I've owned the book for years, and since the movie just came out, I figured I should read it now or I probably never will. I'm not very far in, but so far it's what's to be expected of one of his books: simple writing, lots of cliches and a love story. Perfect escapism reading. 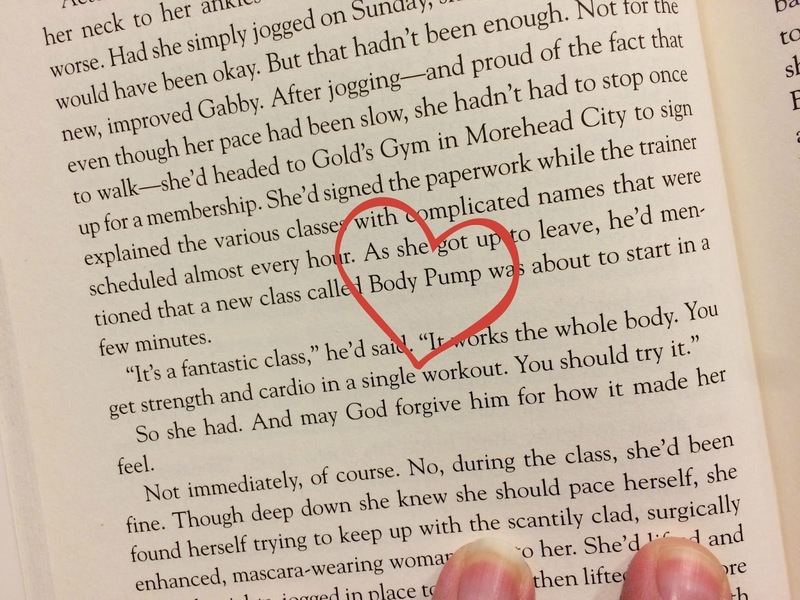 I also couldn't help but get a little too excited about his mention of Body Pump! Not too sure which book I will read after The Choice...I have quite a few piling up on my end table. I always think I have a bit of a plan on what I will read next, but then something else always pops up. And I haven't forgotten about having an online book club...I'll have a post up soon about it and what book I'm hoping we can read for it! Also, I've teamed up with the very lovely Becky and Allison for a new book feature and our first post debuts next Wednesday! You can read more about it here! Listening to: I just heard one of Wintersleep's new songs, Amerika, on the radio and can't get enough of it! Their new album comes out March,4, 2016 and I have high hopes for it! (There's no video yet, this is just the audio). I also just finished listening to season one of the Serial podcast and I have to say, I was so disappointed with how it ended. But such a fascinating story! I don't want to give anything away, in case, like me, you're late to the game on this one. If you haven't listened to it yet, you really should. And, thanks to Ange for finding and recommending Here to Make Friends, which is a podcast that recaps each episode of The Bachelor. It's snarky and funny and will make your Bachelor life complete. Watching: Other than The Bachelor and Schitt's Creek...not a lot! We watched the first episode of Making a Murderer, and will definitely continue to watch the rest of the season. 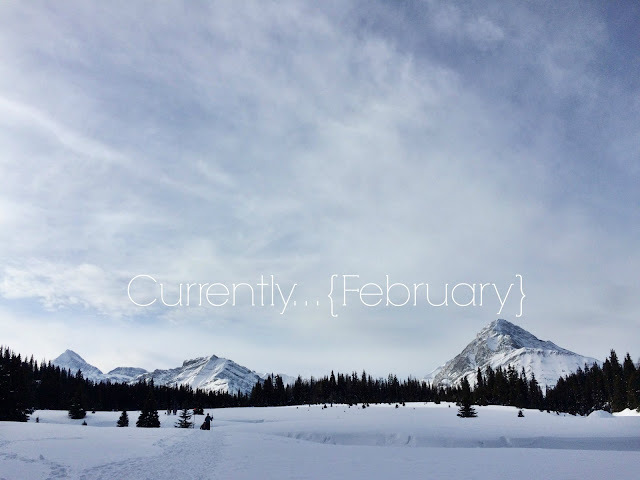 TV has kind of been on the back burner lately, but we have so many shows we need to get back to. Like The Walking Dead! Mostly because I'm so terrified of accidentally seeing or reading a spoiler on it! Eating: I fell off the meal planning train when my mom was visiting us, and then our little weekend getaway to BC didn't help things either. But I'm determined to get back on track because when I actually meal plan and grocery shop accordingly, I seem to eat WAY better. Probably because I actually have leftovers to eat for lunch and don't just start grabbing random things to eat during the day. Overall, I'm feeling a lot better with my food choices. I definitely think working out regularly is playing a huge role in this. When I workout, I just eat better. I want to eat better. Wearing: My fitbit. I mean, I usually wear it, but then, some days it would be dead, and I'd lose a day or two of tracking my steps while it was charging and I really didn't care. But lately, with my monthly goal of hitting 10,000 steps a day, I'm pretty obsessed with it! And then this week and I went and created a "work week hustle" challenge between myself and all of my blogging friends who also have fitbits so now the pressure is on! On a related note, have you seen the new Fitbit Alta that is being released in March?! It's so pretty and I want one! Have you listened to Serial? Which podcasts do you enjoy? Best meal you've made lately?